Not to be confused with Rzepa. Žepa (Cyrillic: Жепа) is a small town on the short river with a same name, the Žepa river, in eastern Bosnia and Herzegovina, in the municipality of Rogatica, in the Republika Srpska entity. It is located northeast of Rogatica itself, southwest of Srebrenica and northwest of Višegrad. It lies on the small river Žepa that flows into the Drina river nearby, in a valley between the mountains Javor and Devetak. In 1991, the population of Žepa was 2,441, of which 2,330 were Bosniaks (95%), 103 were Serbs and 8 identified as Yugoslavs. 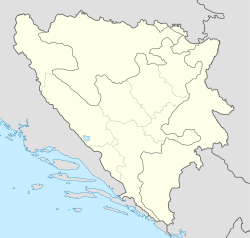 During the Bosnian War (1992–95), Žepa became one of three Bosniak enclaves in eastern Bosnia surrounded by the Army of the Republika Srpska (VRS), along with Srebrenica, a short distance downstream, and Goražde farther upstream, after other towns such as Foča, Bratunac and Zvornik were taken by the VRS. In 1993, the town was declared a United Nations safe area and had a small Ukrainian Army unit of UNPROFOR peacekeepers stationed there. The Bosniak military commander of the enclave was Colonel Avdo Palić, who disappeared soon after the town was captured by the VRS on 25 July 1995. According to eyewitness accounts, he was murdered at the orders of VRS General Ratko Mladić. 116 Bosniaks were killed in the takeover. Unlike in Srebrenica, a widespread slaughter of Bosniak men did not occur, as most Bosniak fighters had fled the enclave by the time Bosnian Serb forces arrived. Meanwhile, Bosniak women, children and the elderly were evacuated to Sarajevo. In the trial of Zdravko Tolimir, who was implicated in the Srebrenica massacre, the trial chamber found that the killings of the three top Bosniak civilian and military leaders of Žepa, and the consistent attacks on the population followed by the forceful transfer amounted to genocide. The appeals chamber of the ICTY, reversed these convictions regarding the events in Žepa as qualifying as genocidal acts, however it was reaffirmed that the Bosnian Muslims of Srebrenica, Žepa, Gorazde and "Eastern Bosnia and Herzegovina in general", were members of the targeted group and thus "the ultimate victims of the genocidal enterprise against the Muslims, of Eastern Bosnia and Herzegovina". ^ Velma Šarić (4 May 2012). "Demographics of Bosnian War Set Out". Institute for War & Peace Reporting. Retrieved 22 March 2013. ^ Marlise Simons (12 December 2012). "Court Convicts a Bosnian Serb General of Genocide". The New York Times. Retrieved 22 March 2013. ^ ICTY conviction of Zdravko Tolimir, icty.org; accessed 18 November 2015. Totten, Samuel; Bartrop, Paul Robert; Jacobs, Steven Leonard (2008). Dictionary of Genocide: M–Z. Greenwood Press. Retrieved 22 March 2013. Wikimedia Commons has media related to Žepa. Michael Sells - David Rohde's "Endgame: The Betrayal and Fall of Srebrenica"
This page was last edited on 8 April 2019, at 00:37 (UTC).